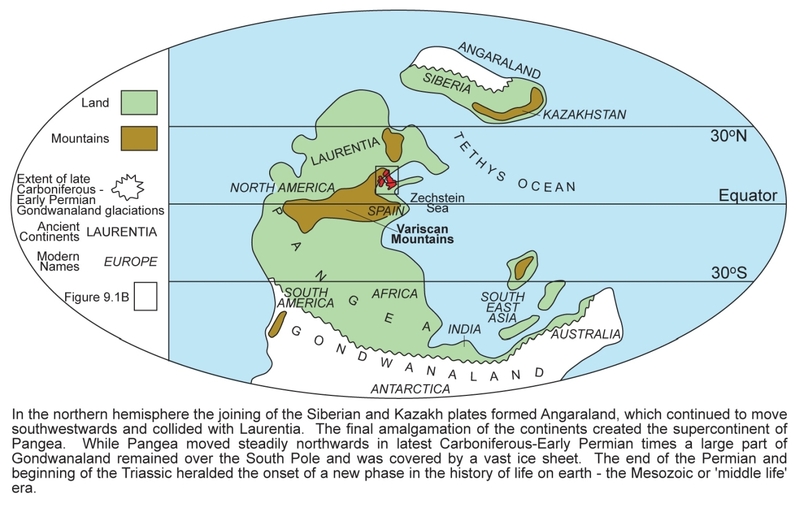 After continental collision during the Variscan Orogeny, northwest Europe lay in equatorial latitudes within the Pangean supercontinent (P947839) during the Permian and Triassic . 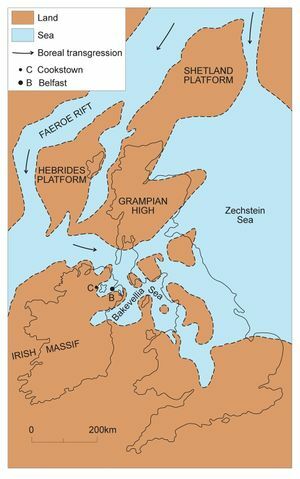 In Northern Ireland, while Carboniferous stress fields were influenced by northeast-southwest-trending Caledonian structures, the Early Permian is the first time that the effects of North Atlantic rifting can be detected. Permian rocks only crop out south of the Highland Border Ridge (P947841). The succession consists of the Enler Group at the base, consisting of coarse, clastic rocks, overlain by the Belfast Group, which is divided into a calcareous unit (‘Magnesian Limestone’) and the succeeding unit of fine-grained clastic rocks with evaporites (P947937). In the western part of Northern Ireland near Cookstown, the exposed, but attenuated, Permian basal clastic sequence represents a regolith that developed in an area of relative uplift. 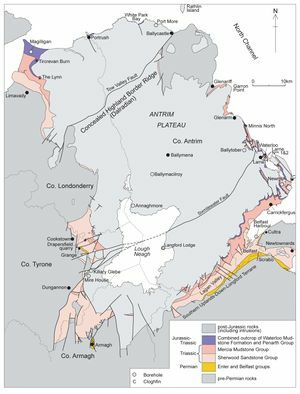 Beneath the Antrim Plateau in Co. Antrim, the discovery of a thick Permian volcanogenic succession in deep boreholes demonstrated the existence of contemporaneous discrete, fault-bounded, basins, separated by areas of higher ground. 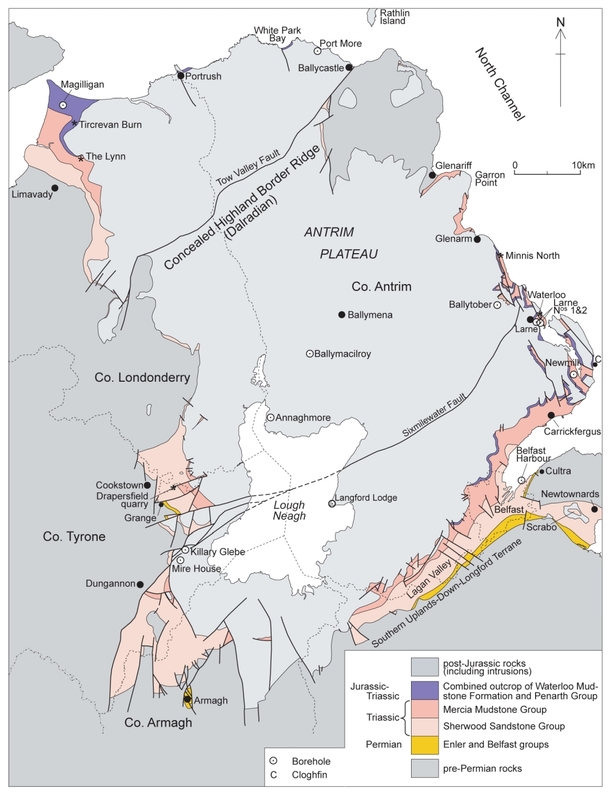 The Late Permian ‘Magnesian Limestone’ occurs in all outcrops and deep boreholes and has been formally renamed the Belfast Harbour Evaporite Formation in Northern Ireland. It was deposited during a marine transgression (P947840) which signified the end of the erosion and rapid peneplanation of the Variscan Mountains and of earlier episodes of basin subsidence. Based on the abundance of gastropods and bivalves, a tentative correlation has been proposed  with the ‘Lower Magnesian Limestone’ EZ1 Cycle in eastern England . In the Early Permian, sedimentation in Northern Ireland occurred primarily in an arid, hot, desert environment. However, in the Late Permian (P947840) a southwards migrating transgression created the Bakevellia Sea in which the ‘Magnesian Limestone’ was deposited . Palaeontological evidence from Co. Tyrone indicates two cycles of marine transgression causing a reintroduction of a benthic assemblage . However, at Cultra (P947841) despite evidence of up to three carbonate-evaporite cycles, Late Permian sedimentation patterns are variable due to the proximity of contemporary shorelines, the migration of marginal marine facies and influence of local tectonism . ↑ Osborne, R, and Tarling, D H. 1995. The Historical Atlas of the Earth (A Visual Exploration of the Earth’s Physical Past). Viking. Penguin Books Ltd., London. ↑ Smith, D B, Brunstrom, R G W, Manning, P I, Simpson, S, and Shotton, F W. 1974. 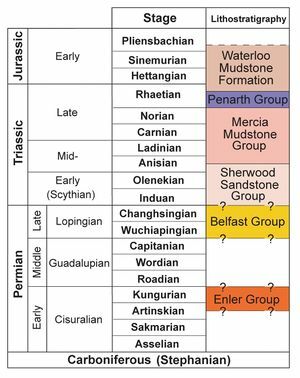 A correlation of Permian rocks in the British Isles. Journal of the Geological Society of London, 30, 1–45. ↑ Smith, D B, Harwood, G M, Pattison, J, and Pettigrew, T H. 1986. 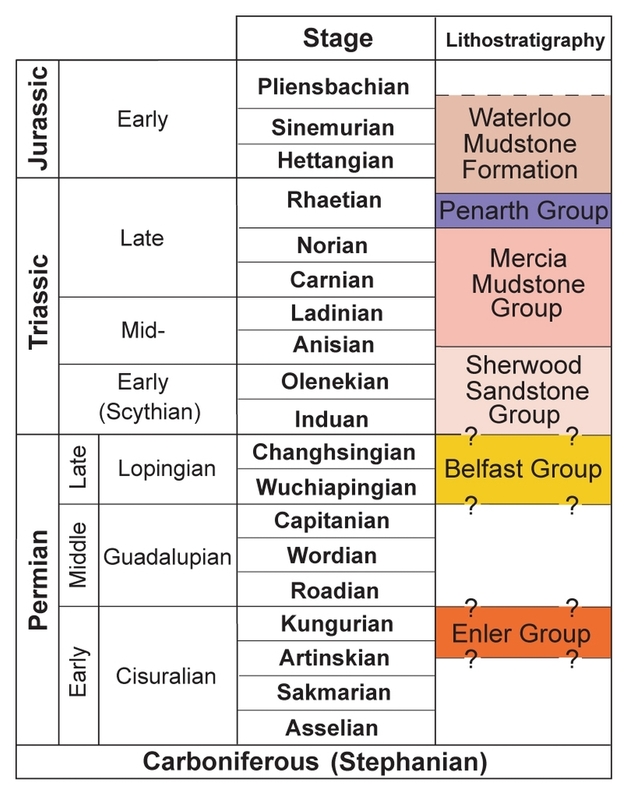 A revised nomenclature for Upper Permian strata in eastern England. In: Harwood, G M, and Smith, D B (eds.). The English Zechstein and Related Topics. Special Publication of the Geological Society, London, No. 22, 9–17. ↑ Ziegler, P A. 1990. Geological Atlas of Western and Central Europe. 2nd Edition (completely revised), 239 pp + 54 enclosures. Shell Internationale Petroleum Maatschappij B. V, The Hague, Netherlands. ↑ Pattison, J. 1970. A review of the marine fossils from the Upper Permian rocks of Northern Ireland and north-west England. Bulletin of the Geological Survey of Great Britain, 32, 123–65. ↑ Smith, R A. 1986. Permo-Triassic and Dinantian rocks of the Belfast Harbour Borehole. Report of the British Geological Survey, 18, No. 6. This page was last modified on 25 September 2017, at 13:55.